Sorry for the double post today but I've been putting this off for too long already. It's kind of a big deal to have a business card in Japan. I can't tell you how many times I've been asked for one and don't have one to hand out. 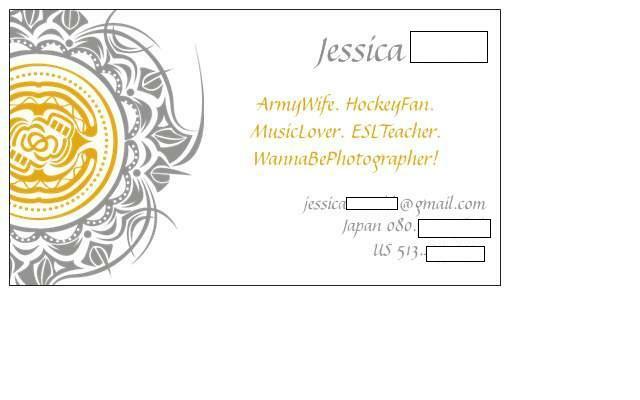 Since I don't have a true profession here, I've been having a hard time trying to decide what to put on the card so that it doesn't look lame with just my name, email and phone number. This is what I came up with today. What do you think? Is it corny? I totally just used my little "about me" from my twitter account. Do you have a personal business card? What is on it? I'm completely open to any suggestions you may have! I keep debating on whether or not to put my blog URL on it. I'm not sure I want EVERYONE to have that. I think I'll just write it on the back if I want someone to have it. HELP! Tell me what you think! I've been wanting to get some "contact cards" (I feel weird calling them business cards, since like you say, I don't have a marketable profession here right now - the photog work has been put on hold indefinitely) just because I'm still constantly meeting new people and getting new contacts, and I get tired of rummaging for spare scraps of paper in my purse. I plan on putting my name, phone, and email, and also my facebook and twitter. Still not sure about the blog myself, either. Mine has my name up at the top, centered, and underneath that it says "Navy Housewife and Volunteer" in a cheeky kind of in your face "yeah, I said it" kind of way. Then it says to have your people call my people and we'll do lunch with my contact info. I put my twitter handle, e-mail, phone, facebook url and address. I'm wishing I didn't put an address since I know we'll move before I use them all. I did not putmy blog as I don't want everyone and their brother heading on over. If they tweet with me they'll get linked over to it if they want. How cool! 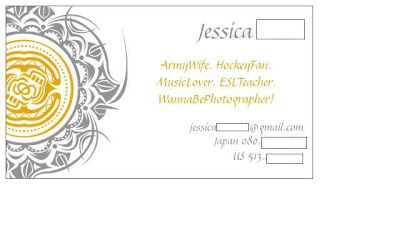 I kind of want to get my own contact card, especially now that I'm really working on my writing career. Where are you getting yours from? I designed mine but I haven't got them printed yet. Just very simple name and contact details on the front with photo of me that has has a sketch filter applied in black and white to one side on the back.